Exhibition 1: artwork by Helen Verhoeven and Alon Levin. The work was specifically created for the space at the Tommy Hilfiger showroom on the Rokin in Amsterdam. The artists were chosen by the curator, Sandi Gehring. Paintings: a wall installation by Helen Verhoeven, presents 104 black and white paintings on a 12 x 5 meter wall. The works are hung side by side, and above and below one another, to create a salon-style display of wide-ranging interpretations on the theme of portraiture. Painting styles and moods within the abundance of faces on the wall seem to clash and harmonize simultaneously. Patterns and connections are discovered as the diverse references enter into dialog with one another. Fragments of old masters’ paintings can be found besides pop-culture icons; film stills are referenced, some contemporary artists quoted; characters from Verhoeven’s earlier work and portraits of her sculptures are present, while images from her research archive are distorted into vaguely familiar but entirely unnamable new creatures. Center of the Universe, Follow Me: a giant sculpture created by Alon Levin, suspended from the ceiling in the center of the room. These cardboard boxes in the form of panels of some sort are jutting like flags on broomsticks in all directions from a wooden central hub. They all seem to hold something waiting to be revealed or perhaps something that has been discarded and stored for some time. Nothing is colored just the emptiness of a seemingly collapsed system is celebrated by the object’s presence hanging from the ceiling in the center of the room. The work hanging in the grandness of the room with its 5 meter high ceiling and wide tall windows, suggests possible past or future narratives, or perhaps a center in suspense, waiting for everything to implode into it. Art Dinner: art meets fashion in a creative environment. 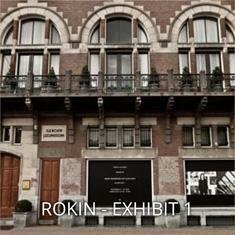 For the opening of the exhibition, a private dinner was staged on the Rokin in the room surrounded by the artwork of Levin and Verhoeven. The event was a partnership between Tommy Hilfiger and Fantastic Man magazine. The intimate dinner for 25 guests, all working in different disciplines of Art and Fashion and traveling from different cities, created a platform for fascinating discussions and conversation.